Here is Ronnie’s verdict on the elk goulash recipe. I’ve been eating it for dinner every evening since I cooked it. It tastes amazing, not just because it’s my recipe but because the flavour of elk is so different from the beef that my grandmother used to make it. We are of Hungarian origin, so my grandma cooked Hungarian. I think the goulash I made was better than hers. I feel guilty for saying it but it’s true. It has a much richer flavour. More robust but not over poweringly different from beef goulash. I also didn’t add any noodles in the stew, or rice. (You’re actually supposed to add hand made egg noodles pinched and dropped into boiling water). I found the goulash to be thick enough without adding carbs (noodles, rice). I was totally full on one regular bowl. I got my protein and all my veggies. With just room enough for some dessert – a dark chocolate covered frozen strawberry yogurt bar. I love this recipe. I’m not big on cooking so it’s perfect. I can eat it all week. I don’t feel hungry at all, and it’s so delicious that I look forward to my elk stew/goulash at the end of the day. I have a warm fuzzy feeling after dinner. And I’m losing weight. And it’s not even a struggle to lose the weight. I feel satiated so I don’t have cravings when I watch TV at night (which I do, religiously, even if TV watching is a big waste of time). 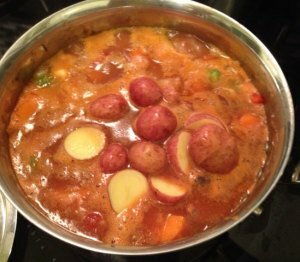 Please let me know if you have tried the elk goulash recipe and what you think of it.